Presenters must mount their postersbetween 1:00 PM - 3:30 PM and remove them by 10:00 PM. Posters remaining after will be discarded and UKC committees are not responsible forposter materials left. Posterswill also appear in the electronic publication. Presenters will be given abstract # upon acceptance. Poster board will indicate the abstract #. 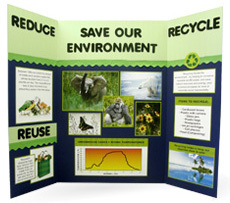 The display board is 36"W x 48"H (3ft x 4ft). Please make sure the poster is not bigger than the display board. - Font should be large enough to read from 1 m distance. - If you are using PowerPoint slides printout, please print them using standard paper. Tape will be provided. - Poster session will be located in Grand Hall West. Each poster board will be marked with abstract # and color coded for each symposium. - Pins and/or tape will be available at the room during poster set-up. Please ask for them to organizers/volunteers. Posters are scheduled to remain on display until 9:00 PM and be removed by 10:00 PM. Posters remaining on the display board after removal hour will be removed by organizers and discarded. For general questions regarding poster presentations or preparation, etc., contact poster session coordinators at UKC2015@ksea.org.